Bad Skate Design & Recommendations from Coach. 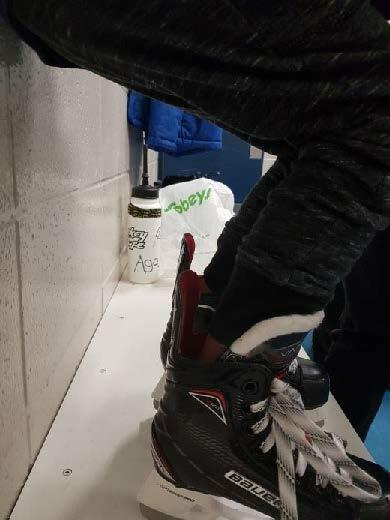 The picture below is shows the skate boot height comparison between my skate (a skate a 6ft tall man could wear) and the skate of a 4.5 year old who is about 3ft 8 in high. Please note the difference in the height and without being too scientific a 6 ft. tall man’s ankle and shin is arguably 1.7 times higher than the 4.5 year olds. 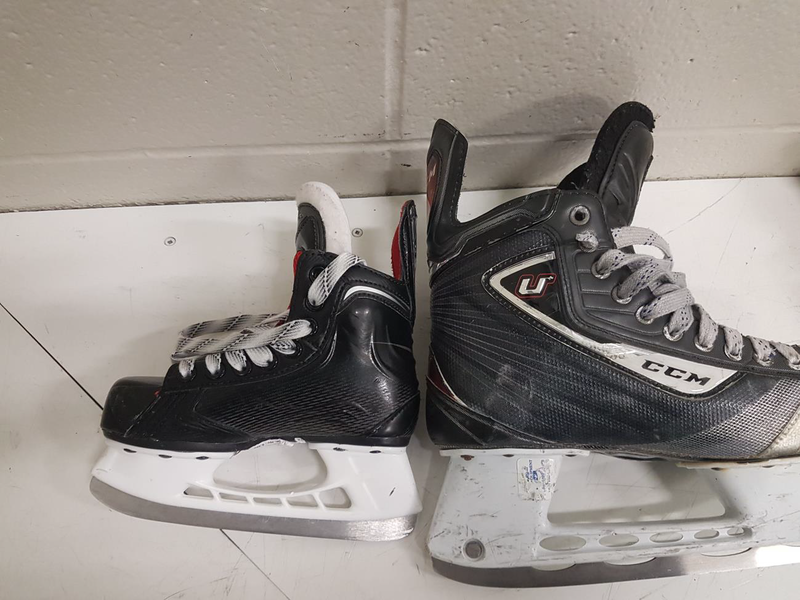 So the skate on the left, if properly designed should be about half as high as my skate to accommodate an ankle and shin that is half as big as mine. The ratio that you see above is very bad for small and young children. Small kids are skating in ski boots and if you have walked in ski boots you know that is not good. Now any of you that attend my programs know that I preach “HOCKEY POSITION”. 90% of the time in a hockey game players are or should be in the Hockey Position. This means that the foot and upper thigh form a Z and the knee and ankle are bent as shown below. Note the space behind the leg. The bending of the knee and ankle are critical for skating prowess, power balance, turning, ability to stop start and change direction. When I teach I get frustrated that the younger kids are not bending their knees and ankles despite my repeated demonstrations and preaching. 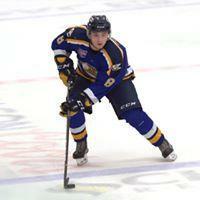 I have recently been providing some one on one training an eager young player who is keen to play in the NHL. And to his credit he is already doing pushups, situps, squats and ankle lifts!!!!!! 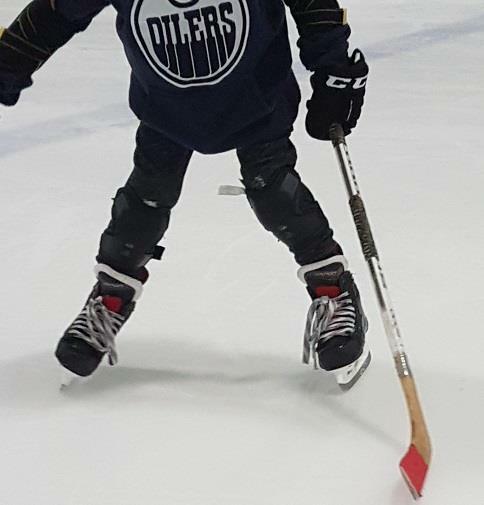 As I am able to observe him on a micro level I have finally figured out why these kids are unable to get the Hockey Position. It now so obvious to me I am frankly a little angry with myself that I did not solve this issue sooner, memories of impeded children are flooding my mind. 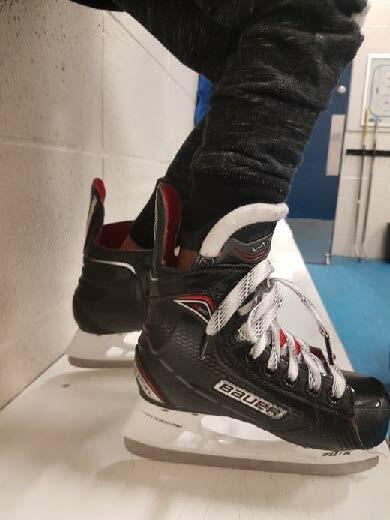 Kids cannot bend their knees and ankles because the ankle is locked in an upright position due to the design of the skate boot. The design of the skate is poor. The boot is simply too high and prevents the ankle from bending which prevents the forward angle of the leg. The height of the boot is simply way too high. For this year’s skate simply undo the top eyelet of the skate and tie the skates lower. Make sure the skate is tight through the foot and tighter on the ankle. Please note the obvious difference in the child’s ability to BEND. The change is noticeable and immediate. The player can now bend his knee and ankle and this will allow us to progress even faster. After we made this change we trained for an hour and his skating was IMMEDIATELY better and it was noticeable and he enjoyed it better. Please try this it will have an instant impact on your child’s ability to skate. Please try this at least 3 times. I highly recommend this. The 2nd part of the solution is next year try to find a better designed skate but I don’t think you will so next year do the same thing. 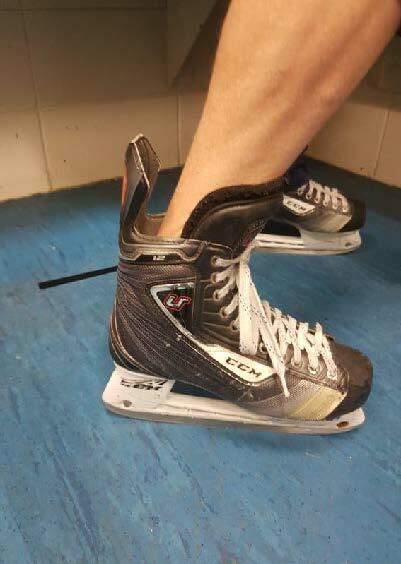 Another suggestion I would recommend that when you are at Public Skating that shin pads not be worn to allow more freedom in the lower legs. My final suggestion for this winter is get your kids on the outdoor ice as much as you can. The rough ice is hard to skate on and gives their stabilizers a great work out. Just make sure to get them sharpened later, natural ice is hell on edges. I am going to design a better skate for kids I have a few ideas and will be meeting with a couple of people shortly.